Please take the following advice with a big grain of salt, partly because I have no formal training in visual design, but mostly because visual design for neo-old-school products can be more art than science. Don't get me wrong; there are solid rules/guidelines for visual design, but some neo-old-school products intentionally eschew good visual design concepts in order to evoke a "classic" look & feel. So do what feels best, but don't completely abandon ease-of-use. Fonts: Do you want more than one font? Different fonts are good for different purposes: Body text vs. headers, or even one font for plain text and another separate font for italics (or other forms of emphasis), all in the same body paragraph. Do you have a license for embedding fonts in pdfs, or will you have to purchase one, and will this budgetary factor inform your font choices? Room Numbers & Names: Should these details be on separate lines from the room descriptions? Should they be more noticeable (e.g., bolded or underlined)? Should each room name be preceded by some white space, to help the room name stand out? Start of Paragraph Style: Do you want blank lines between paragraphs, or would you prefer indenting at the start of paragraphs? What about both? Columns: One, two or three columns? Or maybe something different, such as a main column spanning two-thirds of the page, with one third of the page reserved for notes or sidebars. Headers & Footers: Should every page have top and/or bottom elements that identify the current section or display other important details? Page Numbers: Where should they go? Bottom? Top? Centered? Outside edge? 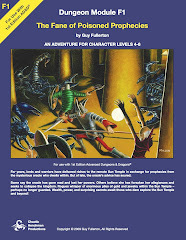 Tables: How do you want to format xp charts, spell progressions charts, wandering monster tables, or similar? Will you need additional software or graphics assistance to get the look right? How should the columns be justified? What's the ideal column order? Should you repeat the table headers (column titles) if the table spans multiple pages? Do you need alternating row colors to help guide the eye across rows? Boxed Text: Think about the ideal line thickness for the box, the amount of whitespace within the box (between all sides of the box and the contained text), as well as the amount of whitespace after the box. Think about how you want to handle cases where one piece of boxed text needs to span multiple columns or pages. Also, some people absolutely loathe boxed text, so consider whether inclusion of boxed text is worth losing potential readers or sales. … and so on. 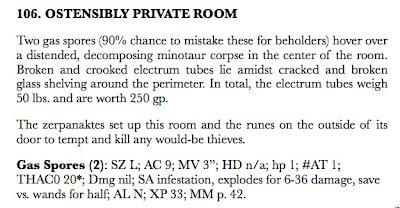 And that's only for minimalist TSR-like layouts! Elegant / elaborate designs require another whole set of considerations beyond the basics. Think about what you want, and what your product needs. Look at various products – ideally ones you've used in play – and take note of what works well and what doesn't. Now, let's take a look at some design tidbits in more detail. If you're not familiar with these terms, Wikipedia describes the difference between serif fonts and sans-serif fonts. For neo-old-school products, it's hard to fight the allure of classic sans-serif fonts like Futura / Twentieth Century (reminiscent of the DMG) and Avante Garde / Century Gothic (reminiscent of B2 The Keep on the Borderlands). And they look pretty good onscreen. But serif fonts sometimes look better than sans-serif fonts when printed, especially at smaller sizes. 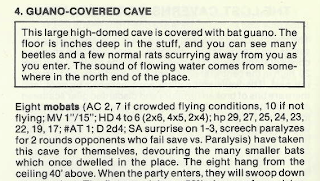 Even if your goal is to evoke a "TSR feel", keep in mind that TSR moved on to other fonts for their main body text pretty quickly, switching to Souvenir (serif) and Helvetica (sans-serif) for B/X & AD&D modules, respectively, around 1980 (see B3 and S4 examples below), and then to something like Book Antiqua (serif) for almost all modules after 1983 (see T1-4 example below). Perhaps TSR's typographers moved the company to serif fonts for a good reason. If you don't care about evoking the feel of the classic TSR products, the serif vs. sans-serif choice is less of an issue. Just pick fonts that include all the glyphs and font features you care about, and that look good at the sizes you plan to use. Test them at a variety of sizes and with a variety of styles (bold, italic, etc.). There are plenty of great serif and sans-serif fonts that look good both onscreen and printed. For 8.5" x 11", use two or three columns. Both are fine choices. Only using one column that spans the whole width of the page is, according to some sources, harder to read because they eye makes more mistakes when moving a longer distance to get from the end of one line to the start of the next line. Three columns allows for more variety in illustration size, by spanning one, two, or all three columns. Three columns also allows for more words per page, mostly because it nicely complements smaller fonts. For digest size products, one or two columns works best. This article uses left justification; the right edge of the column of text appears somewhat ragged, because each line is a different length. By contrast, full justification would make both sides flush with the column edge. See Wikipedia for more info. Full justification generally gives products a more polished feel, and is probably the best default choice. But if your columns are narrow and you can't realistically decrease your font size, then full justification may lead to visual oddities (what Wikipedia refers to as a loose line). This sometimes occurs when trying to wrap text around a picture, and the shortest lines of text have b i g g a p s between letters. In these cases, consider using left or right justification instead. In some cases, you can reduce the occurrences of big gaps by allowing your word processor (or layout software) to automatically hyphenate; you usually need to manually turn on auto-hyphenation in preferences or in the document settings. Separated stat blocks are easier to find during play. Or rather, because separated stat blocks are their own paragraphs, you can lay them out differently in order to make them easy to spot during play. 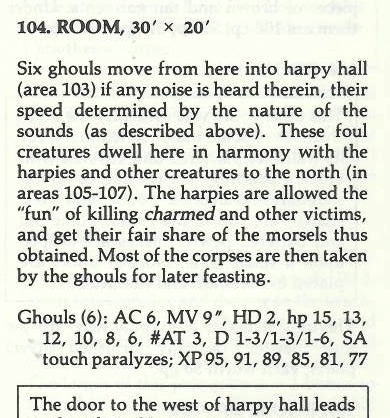 The top example improves noticeability by indenting every line after the first in the Ghouls' stats. The second example does it by bolding the creature name, and also by using left justification. By using left justification, the second example avoids the b i g g a p s problem that would have been caused by the use of non-breaking spaces to keep stat names (e.g., "THAC0") on the same line as the stat value (e.g., "20*"). The non-breaking spaces technique is described a little further below. Separated stat blocks scale to long lengths very well, such as when a particular creature/NPC has many spells, and/or a list of important gear. 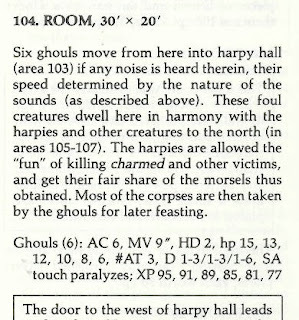 They also provide more room for the referee to make notes about the creature during play. Short inline stat blocks work much better than long inline stat blocks. In the second example, notice how far your eye needs to track downward in order to resume reading the area description, whereas the first example's jump is much smaller. The second example is too long to be inline; it should have been a separated stat block. Inline stat blocks are best when they don't interrupt the sentence flow. The first example is better in this regard because the stat block comes at the end of the sentence. 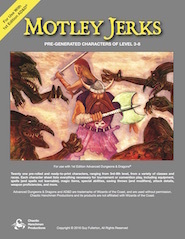 The second example does offer one key advantage, however: The bold creature name improves the reader's ability to quickly find the start of the stat block. This increases in importance when a paragraph contains multiple stat blocks. But ultimately, avoid inline stat blocks unless they're short. Anecdotally, it looks like vintage publications pretty much stopped using inline stat blocks after 1983 or so. 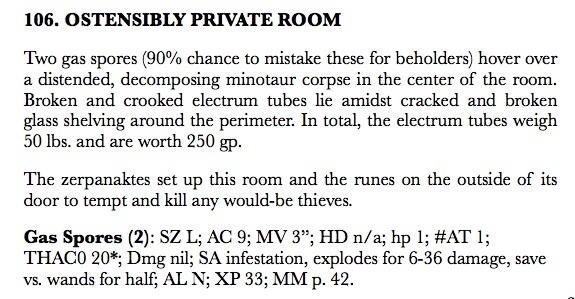 Even TSR's Basic/Expert modules, with stats as short as those in the B3 example, were done as separated stat blocks. Much more vintage content was produced with separated stat blocks than with inline stat blocks. Perhaps the vintage publishers ultimately settled on the best of the two formats. Those examples don't use non-breaking spaces. 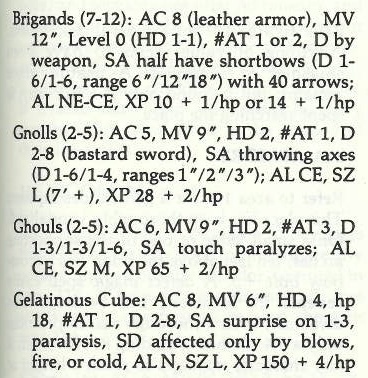 So if you want to look up the gelatinous cube's hit points, first you need to find the "hp," and then your eye needs to track back across the column to the start of the next line to get the value. Ditto for the brigands' MV score and the gnolls' damage. That's inefficient. Because of how we visually look for stats – usually by looking for the stat name – it's best if the stat value is always right next to the name, and not on a separate line. Non-breaking spaces in the relevant places (e.g., between MV and 12") would have made these stat blocks easier to use. Tangent: Another unfortunate situation is the brigands' short bow damage. The line wraps in the middle of the damage range "1-6". That's just ... ugly. You can use a non-breaking hyphen character to solve that, but ideally the whole damage phrase "D 1-6/1-6" ought to be kept together, and I don't know whether there's a non-breaking slash character. Finally, non-breaking spaces can be used to prevent "100 gp" from being wrapped onto two lines. Ditto for "60 feet," and a handful of other common situations that are best treated as one word by your software's line wrapping mechanism. As you lay out, look for places where you ought to glue two words together. Do we really need to be drawn so strongly to the stuff that's bolded? Probably not. 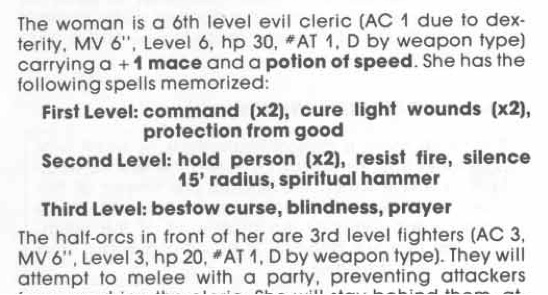 The bolded magic items detract from our ability to find the rest of the details in the cleric's stat block, and the bolded spells make it hard to spot the fighters' stat block. And although it's nice to make spells easy to find, they would have stood out well enough simply through their different layout. 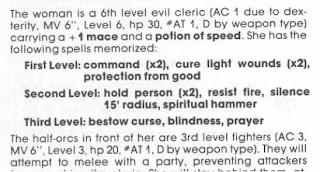 Thankfully, TSR largely moved away from all this bold after about 1983 or so, and began using italics for spells and magic items instead. 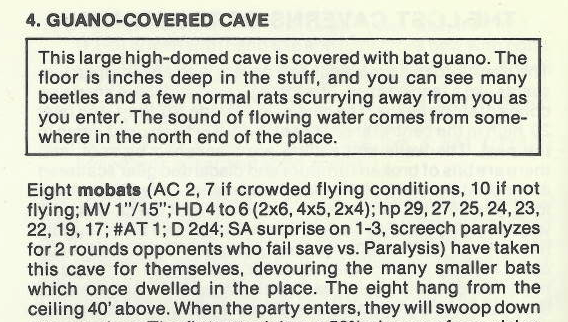 Pretty much only TSR overused bold in this way, until many of us started doing it again in neo-old-school products. We really ought to stop; just bold the things that the reader is likely to need to find at a glance. If your goal is to produce a PDF file not for printing – that is, you intend for it to be viewed only on a computer, iPad, Kindle, or some other electronic device – don't try to format it using typical page-like metaphors. Perhaps the notion of "pages" doesn't even make sense for your target audience; perhaps web-like formatting is a better idea, with a single stream from top-to-bottom. If pages make sense, choose your font sizes & other details based on the physical size you expect the result to be used at. If you're designing for the iPad, choose an appropriate font for when the content is displayed at 5.8 x 7.8 (or whatever the iPad physical screen size actually is). For margins … well, you don't need any … or at least you only need very minimal ones. Why would you need 1/2" margins in a PDF intended for screen viewing only? 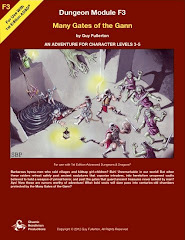 Heck, maybe these ramblings give insight into hybrid PDF & print design. 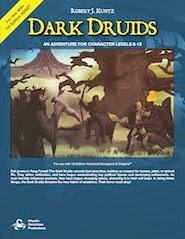 For hybrid solutions should we design for, and generate printed versions at, a smaller format, like digest, A5, or trade paperback? I'm not sure, but I may try it on a future product. Part 6 covers key qualities of good layout. Thanks, Allan. I'll check that out. One of these days I need to stop trying to learning this stuff through trial and error! You'd be surprised (or maybe not) at how much blowback the editors received when we advocated switching from bold to ital for magic items. This is a great series, Guy. And remember, learning this stuff by trial and error is the true old-school way. That's how we did it at TSR, too! Publishing #6: What is Good Layout?